The perfect home office or backyard getaway. You can customize every single element – from adding your own stylish windows and skylights so your workshop is flooded with sunlight; choosing personalized shelving to readily organize your favorite books or tools; and adding special touches like cupolas, flower boxes, and paint colors that show off your unique flair and vision. Continuous piano hinges prevent door sagging, even after years everyday use. The Arlington shed is one of our most customizable options; you can choose the door location – putting your entryway on the eave or gable side depending on your backyard and spatial needs. The picture-perfect Arlington design makes the ideal wood garden shed, home office, workshop, or simply an idyllic backyard bungalow. You choose between 10'x8' and 10'x16' sizes with 6 ft. sidewall height, or 12'x12' and 12'x24' sizes with 7' sidewall height. The Arlington shed is one of our most customizable options; you can choose the door location – putting your entryway on the eave or gable side depending on your backyard and spatial needs. You get extra-wide, steel reinforced doors; so you can easily wheel heavy equipment or carry important tools in and out of your outdoor shed. Your durable shed is wood-built with strong 2x4 construction, so you never have to stress when heavy winds, rain, or snow kicks up during those long winter months. Get your Arlington today and make your backyard a true haven. 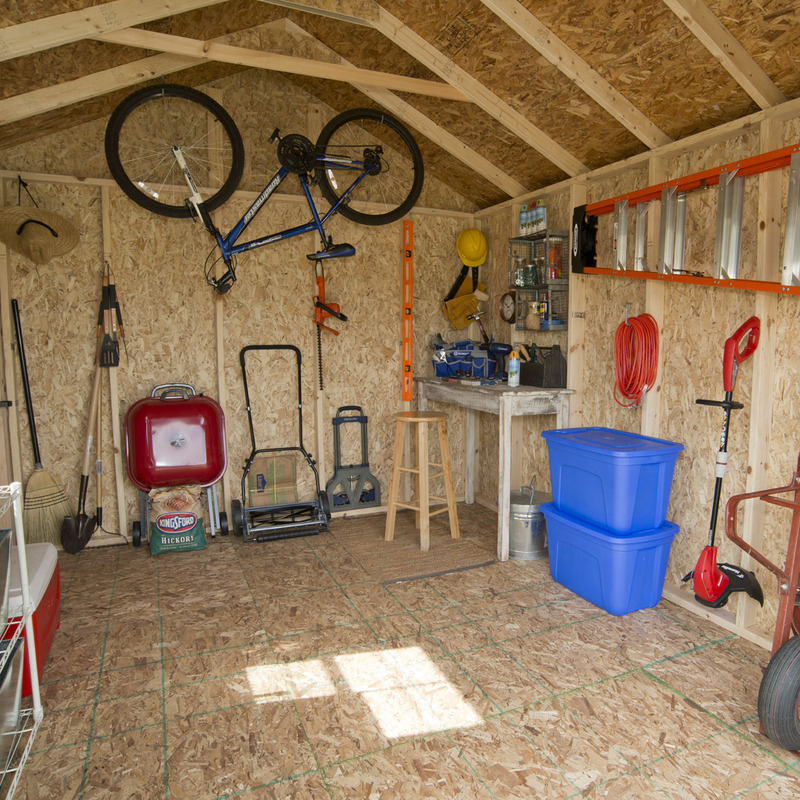 Here, you’ve found a simple, elegant shed that makes your life more convenient, organized, and hassle-free. 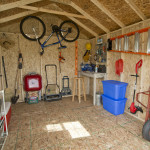 The Arlington makes a stellar garden shed, a picture perfect wood storage building, or of course, a world-class outdoor tool shed – with the ideal wall height for hanging all those hard-to-store long handled rakes, shovels, post hole diggers, and trimmers. As a home office, study, or relaxation spot – the Arlington fulfills your wildest dreams. You can customize every single element – from adding your own stylish windows and skylights so your workshop is flooded with sunlight; choosing personalized shelving to readily organize your favorite books or tools; and adding special touches like cupolas, flower boxes, and paint colors that show off your unique flair and vision. This way, whether your goal is work, play, or simple organization – you have the outstanding building that helps you meet your very specific goals. Whether you create a beautiful, rustic country-style shed for your garden, a handy tool shed to house your wood or outdoor equipment, or a luxurious home office, study, or workshop; the Arlington is an outstanding choice that gives you both customizable charm, and long-lasting build. No more searching, and no more worries – with the Arlington wood shed, you’re on your way to success. Actual Interior Dimensions (w x d) 120"x96" 120"x144" 120"x168" 120"x192" 144"x144" 144"x192" 144"x240" 144"x288"
Actual Floor size 120"x96" 120"x144" 120"x168" 120"x192" 144"x144" 144"x192" 144"x240" 144"x288"
Peak Height 108" 108" 108" 108" 125" 125" 125" 125"
Side Wall Height 72" 72" 72" 72" 84" 84" 84" 84"
Double Door Opening Width 64" 64" 64" 64" 64" 64" 64" 64"
Double Door Opening Height 72" 72" 72" 72" 72" 72" 72" 72"
Floor Joist Spacing 16" 16" 16" 16" 16" 16" 16" 16"
Stud Spacing 24" 24" 24" 24" 24" 24" 24" 24"
Overhang length (Front) 0" 0" 0" 0" 0" 0" 0" 0"
Overhang length (sides) 2" 2" 2" 2" 2" 2" 2" 2"
Assembled Weights 900 lbs. 1136 lbs. 1254 lbs. 1372 lbs. 1343 lbs. 1616 lbs. 1889 lbs. 2162 lbs. Philip did a wonderful job. Appearance of shed is great, sturdy and just the right size. Recommend anyone purchasing go for the vents in the roof-I overlooked them and wish I had ordered them. Shed gets very warm inside but that was my error. Would definitely use them again. The "A" Team called early to let me know that they were on their way and gave me an ETA. They showed up a few minutes early, introduced themselves and reviewed the location for the installation. I was able to watch them during the course of the day and I will say that they were one of the most coordinated and focused construction teams I have ever seen. There was very little wasted motion and the construction went very quickly. The materials used and attention to detail exceeded my expectations. They finished ahead of schedule, cleaned up everything as well, if not better, than I would have. And then took the time to go over everything they did.What a great experience. I would recommend this Company to anyone out there. Pricing was very competitive, service was excellent, quality was above my expectations. This the 2nd shed that I have purchased. The sheds themselves are good. This specific shed we needed to have permitted. The drawings that were provided did not contain all the information required by the city. During the installation process, the in town supervisor, did not want to build the shed per the prints that were provided by the main office. The shed did finally pass inspection but if I did not have the help of a very good general contractor the shed would never been built or passed inspection. It was great experience from beginning to final installation. Have recommended to several freinds. Backyard Buildings exceeded our expectations in all ways. Their customer service was awesome (meaning that when I called them they answered and were always pleasant and helpful). Our shed was delivered on schedule, and the local company that built it were great. When I compared price to other comparable companies, Backyard Buildings came out #1. The builder and his helper came promptly,were very professional,efficient and friendly. They did excellent work. I and my husband were impressed with their work and attention to detail. We are very pleased with this purchase. Overall was an excellent experience. Backyard Buildings was very easy to order, with plenty of options, and the installer was fast, friendly, and very neat. Communication throughout the process was excellent, and I have no issues recommending Backyard Builders to others. Before I purchased, I compared Backyard Builders to others locally and the pricing did not even compare. Very pleased. My builder was prompt and did a great job. It was extremely hot outside, but it didn't faze him at all. Love my shed!!! My shed was delivered and built over 5 months ago, I'm very happy with the design and materials used. The installer was excellent. The installer was on time, polite, professional and left no mess. I checked the shed for level installation and it was perfect.